Dodgers pitcher Ryu pulls off single hits for 7-3 win against Padres. August. 28, 2018 08:18. by Hong-Gu Kang windup@donga.com. It was his bat not his pitch that earned him his fourth win for the season. South Korean pitcher Ryu Hyun-jin for the Los Angeles Dodgers, starred both at the plate and on the mound, winning his first win after three games since his comeback from groin injury. Ryu chalked up his fourth win against the San Diego Padres on Sunday, conceding 11 hits (one home run), 1 walk, and 2 runs, 8 strikeouts for 5⅔ innings. The game made Ryu a winning pitcher again in 127 days since April 22. 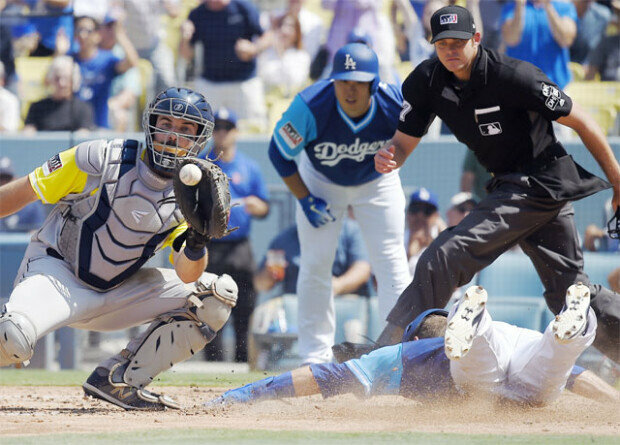 The Dodgers went on to win 7-3 to sweep the three matches against the Padres. It was Ryu’s bat that turned the tide of the game. With two outs and no one on base in the bottom of the fifth inning, the Korean pitcher got his second single hit of the game against Robbie Ervin as the ninth batter. In his first at-bat in the bottom of the third inning, Ryu made a dogged effort to send his first single hit to the left field in the seventh throw. The Korean pulled off two hits in two at-bats until he left the mound after collecting two outs in the sixth inning. Ryu’s composure stood out in the times of trouble. While he gave up as many as 11 hits in a single game, a record tie since his MLB debut, the Korean pitcher managed to allow only two runs. Ryu showed off a highly aggressive pitching style, the strike rate reaching 74.4 percent (64 in the zone out of 86 throws). Of the eight strikeouts, seven were clinched within five pitches. Ryu also throw three three-pitch strikeouts.